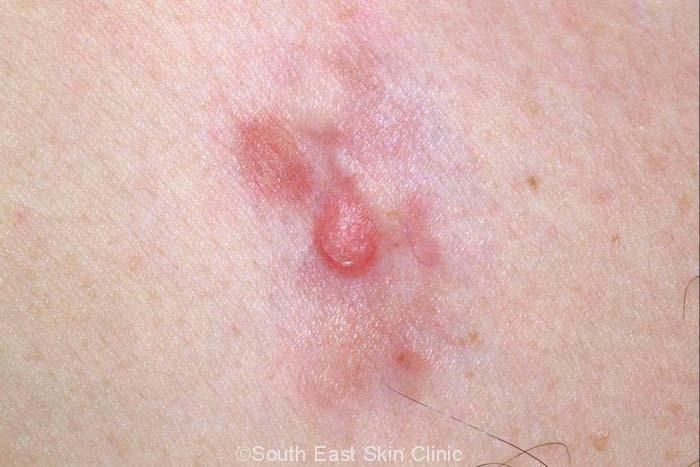 DFSP – very rare aggressive skin cancer. Dermatofibrosarcoma protuberans (DFSP) is a rare type of cancer of the skin (1 in 100,000 people per year affected). The tumour is most commonly seen on the trunk, followed by the shoulder or limbs and least commonly on the face or neck. The tumour is slow growing and eventually grows outwards from the skin to form multiple nodules that are pink, violet-red or skin coloured. Another presentation is that of a firm scar. The condition is so rare that few doctors will ever see a case and the diagnosis will be made by the pathologist when an unusual skin lesion is removed for histology. When you think about it, however, a lesion that looks very unusual will generally be biopsied anyway, and that’s when the diagnosis is made. DFSP is thankfully very rare.